Margo is Research Manager for Energy, Climate Change and Sustainability at the University of Leeds. 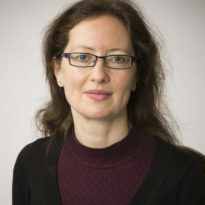 She has managed the administration of the Centre for Climate Change Economics and Policy (CCCEP) at Leeds since its launch in 2008, working closely with the Director and Deputy Director at Leeds and colleagues at LSE. She also coordinates research administration for a number of other energy and climate related projects and centres, including the CIE-MAP Centre, and organises the Sustainability Research Institute’s Seminar Series. Margo has a degree in Geography, and, after teaching English in Japan, worked for several years in social housing. Since 1997, she has worked in Higher Education administration, including as International Officer at the University of York and Projects Officer for the City and Regional Office at the University of Leeds. Margo has a long-standing interest in environmental issues, sustainability and social justice.